At Lustre Formal Wear, we put all our effort into helping you look your best. 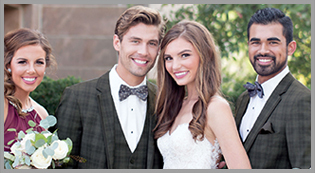 As DC's finest designer tuxedo shop, we offer a large selection of tuxedos and rentals, including the top designer brands. We specialize in large groups and Wedding Parties. Group, wedding, & student discounts are available and below market cost. We also offer convenient pickup & delivery to downtown hotels. Many rentals are on-site and some available same day. Luster Formal Wear, your one stop shop in Designer Formal Wear.